I always enjoy visiting the Cackleberry Club. Laura Childs has written another great installment of this series. Suzanne stops at a local farmers to pick up some cheese for the Cackleberry Club and ends up finding the farmer dead. Of course everyone thinks Suzanne needs to investigate. It was nice to catch up with the residents of Kindred and the patrons of the Cackleberry Club. As always, the writing was superb. This one is set during Halloween, which is another plus. There were twists and turns in this one that kept it very interesting and I was left guessing to the very end. Springtime in the Hamptons comes late, but it’s worth it! Brisk walks on the bright chilly beach, cinnamon buns at tea time, blooming forsythia and….murder? Innkeeper Antonia Bingham has hit her stride as the proprietor of East Hampton’s Windmill Inn. After solving a series of murders, Antonia has taken on more work as an estate manager, giving her entree her into some of the area’s most glamorous homes. Once inside, Antonia checks the heat, looks for leaks or damage, and finds the occasional dead body. As the police can’t be trusted, it’s up to Antonia—a modern day Miss Marple, with an overly enthusiastic adoration of carbs and a kamikaze love-life—to put her skills of deduction to use. Nestle in with a steaming mug of your favorite tea and get ready to peek behind the gates of the mansions of the Hamptons, as Antonia Bingham solves another shocking and devastating murder. This was the first Hampton's Murder Mystery that I have read. I found it a little slow at first, but it soon picked up. Carrie Doyle is a new to me author, and I found that I like her writing style. The characters of this book were well developed and they seemed real. The setting of this series is also great. Antonia is an estate manager in East Hampton, and when she checks an estate where a friend of the owner is staying, she finds him dead in the bathtub. She doesn't trust the police, so it is up to her to solve the crime. This one kept me guessing till the very end and had some good twists and turns. I enjoyed visiting the Hamptons through this book. Carrie Doyle was the founding Editor-in- Chief of the Russian edition of Marie Claire Magazine. She is currently a Contributing Editor of Hamptons Magazine and has written extensively for Harper’s Bazaar, Town & Country and has also written for Women’s Health and Avenue on the Beach. With Jill Kargman, Carrie co-wrote the film Intern (which premiered at the Sundance Film Festival in 1999), as well as several screenplays sold to Showtime, Paramount Pictures, Nickelodeon Films and the Oxygen Network. Carrie and Jill co-wrote five books together, including three teen books for HarperCollins and two bestselling women’s fiction books, The Right Address and Wolves in Chic Clothing (Broadway Books). Carrie also penned the popular novel The Infidelity Pact (Broadway Books). Carrie lives in New York City with her husband and two children and is currently at work on an animated series for broadcast as well as her new series, the Hamptons Murder Mysteries. Fatal Fiction sure did entertain me. Charli left her hometown of Hazel Rock and vowed never to return, but when her dad decides to sell the family bookstore which is housed in a barn, Charli returns to handle the paperwork. She never dreamed she would have to deal with a murder. She has to team up with the town beauty queen to solve this murder. Throw in an ugly armadillo and this makes for one interesting story. Kym Roberts is a great writer, this book flowed so well and went so fast, there were a lot of twists and turns that kept me guessing. The characters all seemed so real, it felt like I really knew them. I look forward to more stories by Kym Roberts. Three career paths resonated for Kym Roberts during her early childhood: detective, investigative reporter, and . . .nun. Being a nun, however, dropped by the wayside when she became aware of boys—they were the spice of life she couldn’t deny. In high school her path was forged when she took her first job at a dry cleaners and met every cop in town, especially the lone female police officer in patrol. From that point on there was no stopping Kym’s pursuit of a career in law enforcement. Kym followed her dream and became a detective who fulfilled her desire to be an investigative reporter, with one extra perk—a badge. Promoted to sergeant, Kym spent the majority of her career in SVU. She retired from the job reluctantly when her husband dragged her kicking and screaming to another state, but writing continued to call her name, at least in her head. Visit her on the web at kymroberts.com. Nick and Nora aren’t just pussyfooting around this time as they deal with a missing person’s case and murder. This is the first of the Nick and Nora Mysteries that I have read, and I will have to say I enjoyed it. There was lot going on, not only a murder but espionage and jewel theft. Nora is asked at the last minute to cater a gala for the Cruz Museum. Of course she gets herself into some trouble while on this catering job. She is also asked by one of the directors of the museum to find her missing niece and this involves Nick's, who is Nora's cat, former owner. There is so much going on in this book there is no way to get bored and you will want to keep turning pages because you just have to find out what happens next. The writing is superb which makes the book flow really well. I look forward to more in the Nick and Nora series. GIVEAWAY: ONE PRINT COPY OF THIS BOOK PLEASE NO PO BOXES ONLY PHYSICAL ADDRESS. TO ENTER JUST COMMENT ON THIS POST AND INCLUDE YOUR EMAIL ADDRESS, NO EMAIL NO ENTRY, AND I WILL PICK A WINNER DEC 11. This one got my attention from the beginning and kept it throughout the book. It was a great holiday read. It had humor and a lot of mystery. 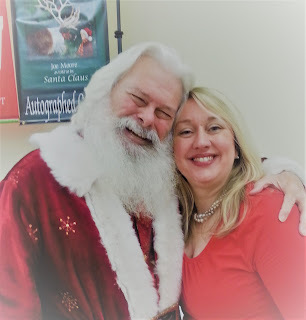 Marcy is asked by her friend Captain Moe to be an elf to his Santa at local hospital. When the hospital administrator is found stabbed to death, Captain Moe is accused of the crime and of course, Marcy has to try to prove he did not do it. There are a lot of suspects in this one which keeps you guessing to the very end. There are a lot of twists and turns in this one. The writing is superb and makes the story flow really well. Angus is also a great asset to this story. I thoroughly enjoy this series and hope it continues. 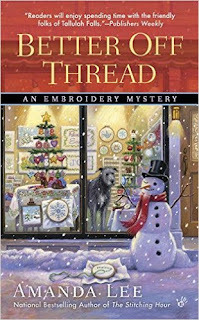 Your Biography Information for your tour page and for use by the bloggers – Gayle Trent (and pseudonym Amanda Lee) writes the Daphne Martin Cake Decorating series and the Embroidery Mystery series. The cake decorating series features a heroine who is starting her life over in Southwest Virginia after a nasty divorce. 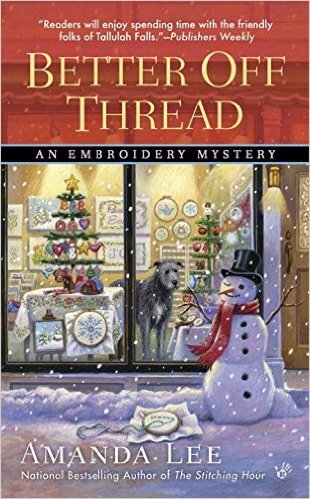 The Embroidery Mystery series features a heroine who recently moved to the Oregon coast to open an embroidery specialty shop. She also writes the Down South Café Mysteries as Gayle Leeson. 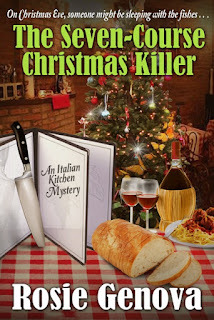 Rosie Genova, author of the Italian Kitchen Mysteries, serves up a new dish this week with the release of her e-book holiday novella, The Seven Course Christmas Killer: A Holiday Novella from the Italian Kitchen. Priced at .99, the e-book will be available on Amazon and most other retailers. The story takes place on Christmas Eve, as Vic and the gang prepare the traditional Feast of the Seven Fishes for their annual holiday party. But before you can say “shrimp scampi,” Mayor Anne McCrae takes a nasty fall that may not be an accident. 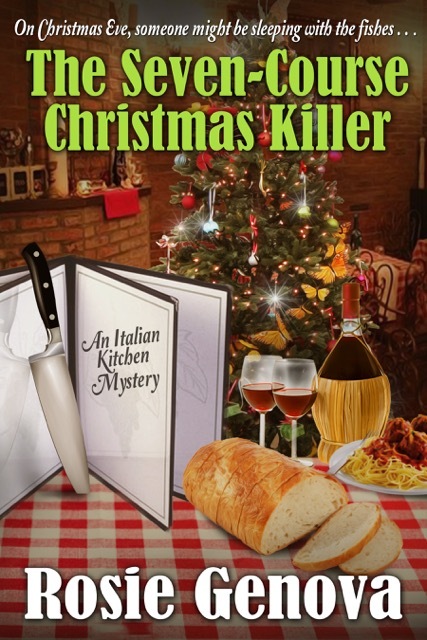 Add a nosy reporter, guests with grudges, and a missing kitchen knife—and Vic suddenly has all the ingredients for murder! On Christmas Eve, someone might be sleeping with the fishes. . .
It’s December at the Casa Lido, which means only one thing: the Rienzi family’s traditional Christmas Eve celebration, including wine, song, and seven Italian seafood courses. As Victoria and Tim prep scungilli and calamari, Nonna directs the cooking until all is in readiness for the big night. But the holiday cheer is interrupted by the attempted murder of Mayor Anne McCrae, who asks Vic to investigate. Trouble is, there are as many suspects as there are fishes on the Christmas Eve menu . . . The proud mama of three grown sons, Rosie still lives in her home state with her husband and a charming mutt named Lucy. She also writes women's fiction as Rosemary DiBattista. Sam Turner is back in this installment of the Home Sweet Home Mysteries. In this installment, Sam is showing a house in the most exclusive neighborhood in town when she finds a severed finger, then a body. Her boss, Everett is accused of the murder so Sam has to investigate. All of this is on top of her sister showing up and camping out at her house. This was as well written as the first installment with the some of the same characters and a few new ones added in. This series is set in a great place, also. This one had some humor besides being a great mystery that kept me guessing till the very end. I received a complimentary of this book. Sarah Hobart is a real estate agent and former newspaper reporter in Northern California, where she lives with her husband and two children in a majestic fixer-upper overlooking State Highway 101. I will admit that the cute kitties on the cover of this book is what drew me in, but then I started reading and was really drawn in by the convincing characters and plot of this book. Lacy has returned home to New Orleans after a painful breakup with her ex-fiancé. Once home, a kind benefactor loans her the money to open her dream shop, The Furry Godmother, a pet boutique. One night, Lacy stumbles upon an intruder in her store and sprays that intruder with her glitter gun. Lo and behold that same intruder ends up murdered, with the glitter gun, and Lacy is the prime suspect. The writing of this story is superb and the setting and characters are so believable. I so look forward to more in this series. I receive a complimentary copy of this book. Julie Chase is a mystery-loving pet enthusiast who hopes to make readers smile. She lives in rural Ohio with her husband and three small children. 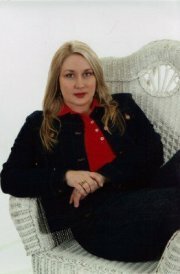 Julie is a member of the International Thriller Writers (ITW) and Sisters in Crime (SinC). She is represented by Jill Marsal of Marsal Lyons Literary Agency. Julie also writes as Julie Anne Lindsey. Luckily, everyone seems to have a pet. I don’t always know what to say to people, but I’m pretty excited about the pets. I strike up conversations with yard dogs and talk to cats seated in open windows. I know them all by name. I’m still working on the humans. Pets are just easier for me. I never feel as if dogs are judging my awkwardness, and when cats are done with me, they walk away. I can appreciate that. I wish people could do that. Anyway - As I prepared for the release of Cat Got Your Diamonds, I had a lot of baking to do, and the new neighborhood became my biggest blessing. I needed animals to sample my pupcakes and meow yum yums, but I didn’t have any animals. Quite a predicament for a petless pet writer. Then it him me. I could test my recipes on the neighbors’ pets! Bonus: What a great icebreaker for an introvert like me. People like people who are good to their pets. It’s as if my new address was destiny. I immediately began peddling my wares door to door like a girl scout, expect my cookies were free and meant for the fur babies of the house. I learned that the dogs on my road like pupcakes. All dogs. All pupcakes. They liked the bacon and applesauce as well as the banana and peanut butter. Maybe I’m a wizard chef. Maybe dogs aren’t choosey. Who knows? But they gobbled them right up in front of me. Added bonus #2: baking pupcakes made my house smell amazing. The results were unclear for my meow yum yums. Neighborhood cats mostly squinted and blinked at my offerings. Though, their people told me later that the cats eventually ate the treats. It’s anyone’s guess if the neighbors were lying to be polite, or if it was true. Cats are pickles like that, but I take the fact the felines didn’t upend the trays to my face as hope. Hey, I call all cat attention a success. For more animal-lover antics and a peek at my yummy (I think) pet recipes, I hope you’ll pick up a copy of Cat Got Your Diamonds. It may not be delicious, but just might make you smile. Cat Got Your Diamonds is book one in the Kitty Couture Mysteries Series published by Crooked Lane books November 2016. Witty and whimsical, Cat Got Your Diamonds, the first in a new cozy series by Julie Chase, will be the cat's meow for fans of Rita Mae Brown and Miranda James. A mysterious woman appears on the doorstep of Great Aunt Sybil’s Attic in the middle of the night. Owner Anne Hillstrom lets her in, only to have the woman die in her arms. With no final words, and only an old lantern clutched to her chest, the dead woman provides Anne and her partner CC precious few clues to discover her murderer or why she spent her last moments in their antique store. The two Antique Hunters search for clues, finding themselves entangled in a centuries-old mystery leading them to a cemetery in Ireland where a ghost from the past has left them a cryptic message, and a killer has left them no choice but to discover his identity before he kills again. On their journey, the two best friends encounter antiques, romance and the key to a murder. This was an interesting story. I got my attention and kept it. I really enjoyed the friendship between Anne and CC, I felt they really had each others back. This was an intriguing mystery because they did not know the woman who showed up unexpectedly at the door and dies. Of course, Anne and CC have to figure out the mystery. This was well written and highly entertaining. This is the first I read in this series, but I hope to read more. When everyone else refuses the job of being Vanessa’s Maid of Honor, Maggie reluctantly takes up the title and finds herself tasked with a long list of duties–the most important of which is entertaining Vanessa’s cousin, Ginger Fleer-Starke. But just days before the wedding, Ginger’s lifeless body is found on the bayou and the Pelican PD, as well as the Crozats, have another murder mystery on their hands. There’s a gumbo-potful of suspects, including an ex-Marine with PTSD, an annoying local newspaper reporter, and Vanessa’s own sparkplug of a mother. But when it looks like the investigation is zeroing in on Vanessa as the prime suspect, Maggie reluctantly adds keeping the bride-to-be out of jail to her list of Maid of Honor responsibilities in Body on the Bayou. This was a well written book that had humor and mystery. Maggie is asked to be the maid-of-honor in her co-worker Vanessa's wedding. No one else wants the job, so Maggie agrees. When Vanessa's cousin comes for the wedding and is murdered, of course Maggie is caught up in investigating. She is also teaching art to Bo Durand's autistic son. I really enjoyed this story and visiting Pelican and it's quirky inhabitants again. I look forward to more in this series. Ellen’s debut novel, PLANTATION SHUDDERS : A Cajun Country Mystery, has been nominated for an Agatha Best First Novel award, a Lefty for Best Humorous Mystery, and a Daphne Award for Best Mainstream Mystery. The second Cajun Country Mystery, BODY ON THE BAYOU , will be available in September 2016. 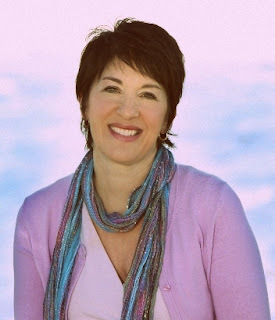 Ellen’s TV credits include Wings and Just Shoot Me; she’s written over 200 magazine articles; her published plays include the award-winning Graceland and Asleep on the Wind. Ellen Byron is a native New Yorker who lives in Los Angeles and attributes her fascination with Louisiana to her college years at New Orleans’ Tulane University.